The six-pack is a thing of the past. Beverages of the future will use the seven-pack format. But how will the mighty spacemen of the future manage to ship the Slurm seven-pack efficiently in rectangular space crates? Below is a schematic of the seven-pack. How can you completely fill a rectangle using seven-packs of this shape? It's ok to turn a seven-pack upside down, giving you a mirror image of the below shape. The arrangement requiring the smallest rectangular space crate wins. Whimmy wham wham wozzle, dudes! 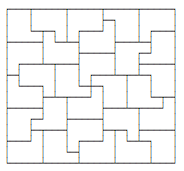 Stated simply, can you arrange an unlimited but finite number of the pictured shape and its mirror image so that they perfectly tessellate a rectangle? Remember that since the rectangle contains an integer number of seven-packs then M x N must be a multiple of 7. Furthermore, since 7 is prime at least one of the two dimensions of the rectangle must be a multiple of 7. I have a 14x14 (28 case) rectangle. It is completely symmetrical. Someone beat that. 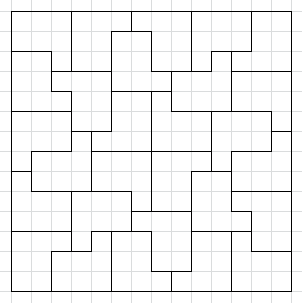 A computer search revealed 96 solutions for a 14x14 square, and no smaller solution. The 96 solutions break down into 3 alternate ways to arrange the 4 center pieces, x2 for clockwise/counterclockwise arrangement, and 4 pairs of 2 pieces that can be flipped. That gives $3 * 2 * 2^4 = 96$ solutions. Not the answer you're looking for? Browse other questions tagged mathematics geometry tiling or ask your own question.